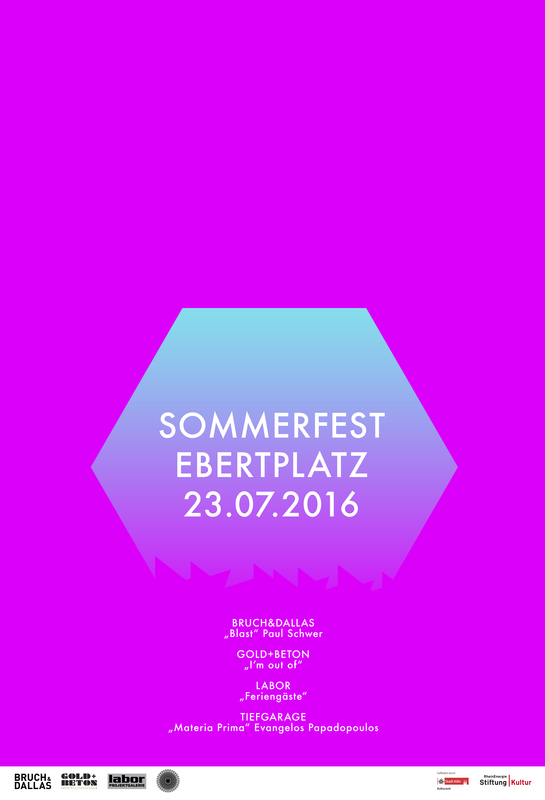 SOMMERFEST EBERTPLATZ // SA 22.07. 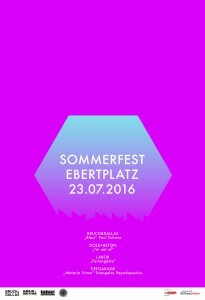 Anlässlich der KUNST BASIS Ebertplatz – Installationen im öffentlichen Raum haben wir das EBERTPLATZ SOMMERFEST dieses Jahr um unsere in direkter Nachbarschaft liegenden Kunstprojekte erweitert, ein mikro Galerienrundgang bevor wir uns alle in die Sommerpause verabschieden. 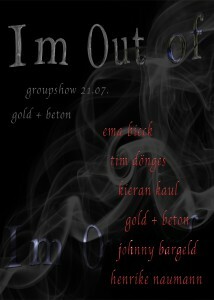 I’m Out Of – Groupshow // 21.07.-21.08. 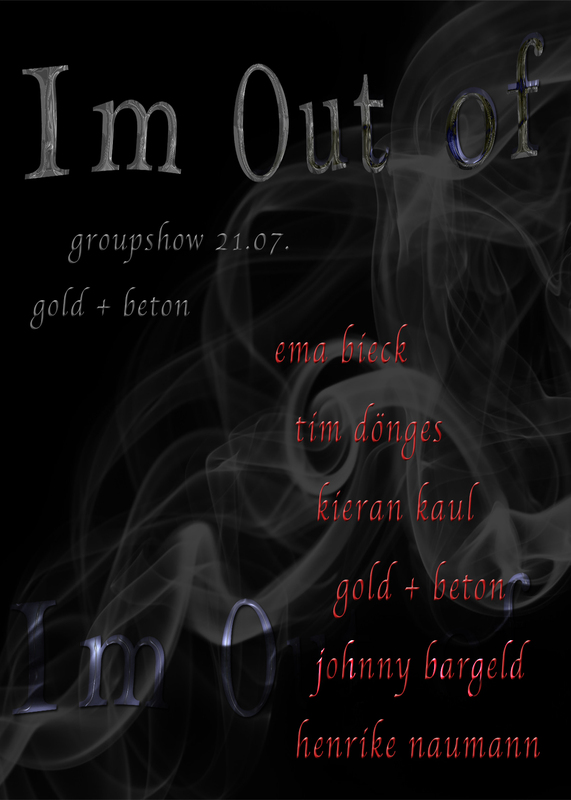 MP GOLD ist eine Art Spiel. Das Künstlerduo bestehend aus Marie Josefin Stute und Philipp Naujoks arbeitet weitestgehend intuitiv und setzt die Beobachtungen der Welt nach den eigenen Regeln neu zusammen. Uns bekannte Umgebungen werden distinktiv wahrgenommen, wodurch zwischenmenschliche Beziehungen, eigene Gefühle und vor allem gegenwärtige gesellschaftliche Phänomene und Strukturen durch das Werk neue Identität erlangen. Einzelne Fragmente aus Video, Zeichnung, Skulptur und Objet Trouvé verschmelzen in MP GOLDs Gesamt-Installationen zu humorvollen Zitaten auf Kitsch und Klischees. 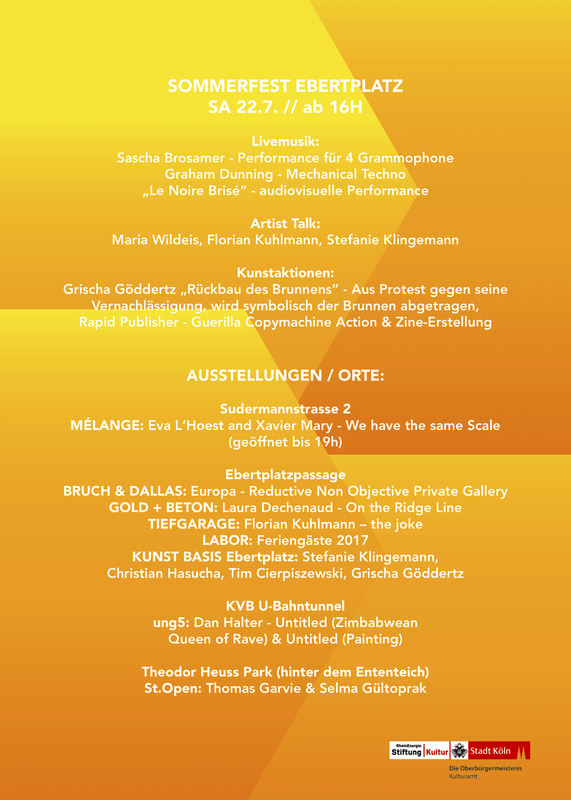 Für die Ausstellung RETROSPEKTIVE zieht das Wohnzimmeratelier des Duos ins GOLD+BETON ein. Selbstverständlich mitsamt oben genannter Fragmente und vielerlei Objekt (und dessen Wesen). MP GOLD is kind of a game. The duo consisting of Marie Josefin Stute and Philipp Naujoks operates mainly intuitive and rearranges their observations of the world into new constructions. Familiar environments are perceived distinctively, while interpersonal relationships, subjective feelings and contemporary social structures and phenomena gain new identity through their work. Individual fragments of video, drawing, sculpture and objet trouvé merge in MP Gold’s extensive installation to peak in humorous quotes on kitsch and clichés. 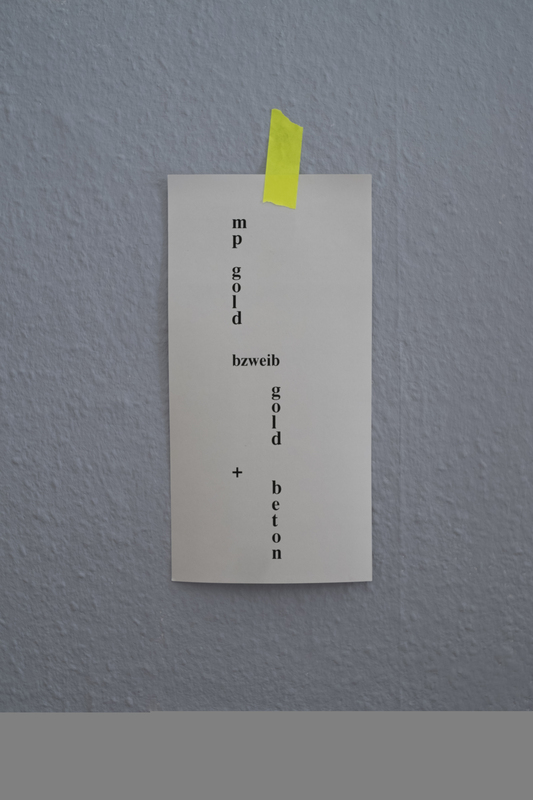 For the exhibition RETROSPECTIVE, MP GOLD moves its livingroom studio into GOLD+BETON. Of course including said fragments and lots of objects (and their souls). Vika Kirchenbauer – YOU ARE BORING! YOU ARE BORING! discusses the troublesome nature of “looking” and “being looked at” in larger contexts including labour within the new economy, performer/spectator relations, participatory culture, contemporary art display and queer representational politics. YOU ARE BORING! formulates a 3D video installation focusing on five performers’ bodies as sites-of-speech free from any physical context. Through strategies that overload the capacities of affective multitasking and the self-consuming illusion of total subjectivity, the spectator is personally addressed and promised exactly what he or she needs. 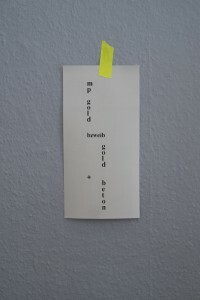 Vika Kirchenbauer is an artist and writer currently working and residing in Berlin. In her work she explores opacity in relation to representation of the ʻotheredʼ through ostensibly contradictory methods like exaggerated explicitness, oversharing and perversions of participatory culture. She examines the troublesome nature of “looking” and “being looked at” in larger contexts including labour within post-fordism and the experience economy, modern drone warfare and its insistence on unilateral staring, the power relationships of psychiatry, performer/spectator relations, participatory culture, contemporary art display and queer representational politics as well as the everyday life experience of ambiguously gendered individuals. Her work has been exhibited in a wide range of contexts in about forty countries and has won prizes at festivals in the United States, South Korea, Brazil, Germany, Spain, Norway, Slovakia, Poland, Bosnia and Italy. Für das IFFF hat Kirchbauer die Sektion „begehrt! filmlust queer“ kuratiert. Die ausgewählten Kurzfilme laufen am DO 21.4. in der Filmpalette und FR 22.4. im Filmforum des Museum Ludwigs.